They look like the real thing! These strawberry waffle soaps will fool anyone and are great for kids of all ages, or just anyone who loves a unique gift. They are scented with a maple syrup fragrance oil and are made with 100% vegetable glycerin soap base that is SLS and detergent free. Great for all skin types, even the most sensitive! 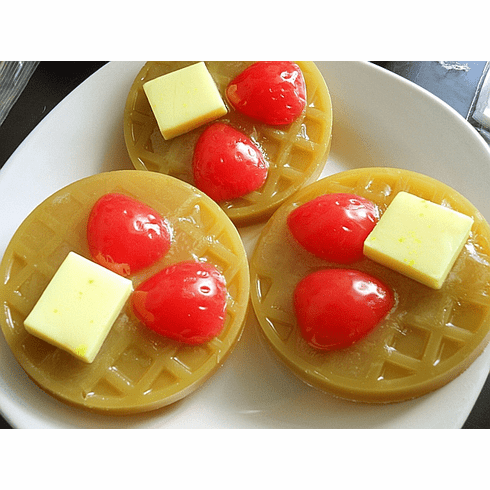 This listing of for one 5 oz waffle soap that is dressed with 2 strawberry halves and a slice of butter. They come wrapped in a clear cello bag with a bow and label. Make great party favors! We can customize packaging and scent. Email us at littlesoapstore@yahoo.com or call (915) 204-6572 about pricing discount when you order 10 or more.